Julian Assange's cat wears a striped tie and white collar as it looks out the window of the Ecuadorian Embassy in London in 2016. The WikiLeaks founder, who was arrested Thursday, has been charged with conspiring to hack into a Pentagon computer network. Presumably, Assange's alleged illegal interactions with former Army intelligence officer Chelsea Manning are the main interest of law enforcement. While holed up, Assange famously acquired a cat. The cat, named Michi, is more well known by its social media moniker, Embassy Cat. More than 30,000 Twitter followers, and 6,000 on Instagram, followed the self-described master of "counter-purrveillance." The New Yorker reported in 2017 that Assange's interest in the cat was less as an animal lover and more as a master of his own brand. "Julian stared at the cat for about half an hour, trying to figure out how it could be useful, and then came up with this: Yeah, let's say it's from my children," the magazine quoted one of Assange's friends as saying. "For a time, he said it didn't have a name because there was a competition in Ecuador, with schoolchildren, on what to name him. Everything is P.R.—everything." The cat arguably played a small role in Ecuador's decision to end its asylum agreement. Moreno explained that Assange treated his hosts disrespectfully; late last year the embassy implemented a series of rules for Assange, including a requirement to be responsible for the "well-being, food, hygiene and proper care of your pet." If Assange didn't, the embassy threatened to put the cat in a shelter. In other words, it is likely that Assange didn't effectively clean up after his cat's own wiki-leaks. 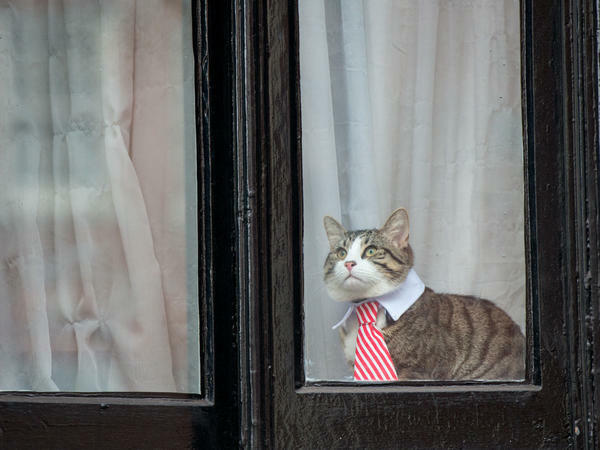 After Assange was picked up Thursday, some people wondered what would become of Embassy Cat. "My sympathy to the cat," author Charlie Stross tweeted. Journalist James Ball said that although he offered to adopt the cat, it was "reportedly given to a shelter by the Ecuadorian embassy ages ago." But according to Hanna Jonasson, whom The Washington Post describes as a member of the Assange legal team, Assange was incensed by the threat to put Embassy Cat in the pound. "He asked his lawyers to take his cat to safety," Jonasson said. "The cat is with Assange's family. They will be reunited in freedom." Wherever the cat is, it's no longer at the embassy. The Italian paper la Republicca wrote in November that the "friendly atmosphere" at the embassy was gone. "Not even the cat is there anymore. With its funny striped tie and ambushes on the ornaments of the Christmas tree at the embassy's entrance, the cat had helped defuse tension inside the building for years. But Assange has preferred to spare the cat an isolation which has become unbearable and allow it a healthier life." The Ecuadorian Embassy in London did not respond to a request for comment. But a spokesperson told Sputnik that the cat hasn't been with the embassy since the fall. "It was taken by Mr. Assange's associates," the spokesperson said. "We are not a pet store, so we do not keep pets here."